Yes, I actually can make small talk when entering a room, I don't require total silence after a single greeting. I thought it might be fun to turn it around for the purpose of parody. I know, dear extroverts, that only rude extroverts do these things. Or worse, introverts pretending to be extroverts in hopes of financial/romantic success (I see you brother, and it hurts my heart). Extroverts have trouble understanding that social outings have to be planned in advance, so tell them that you will make other plans if you don't hear from them by a certain time (they don't have to know that the plan is reading a book). Shock and stun extroverts by mentioning the name of their family members or referencing their hobbies now and then. Listening is like magic to them. They pepper you with personal questions as a way to feel "connected" to you, rather than to get information. They are not so good with the remembering. At work, extroverts will, out of a need to "connect", come to you personally about things that could easily have been shared in an email. Nod and smile while planning your weekend book-reading, then say, "Could you send me an email to remind me?" It is physically painful for extroverts not to speak in a meeting, even if they have nothing to say. Let them speak for a couple of minutes, then say, "Thanks for sharing, X. Let's put that in the parking lot for now." Salespeople and waitstaff are often extroverts, and will engage in nonsexual touching and use of your name, as it increases their income when dealing with others of their kind. Kindly explain that touching strangers in inappropriate, and keep telling them they are mispronouncing your name until they finally give up. *Or at least, limit it to your twentysomething "experimental" phase. Do you really want to go to endless extended family functions, reunions, work parties and spontaneous potlucks for the next fifty years? 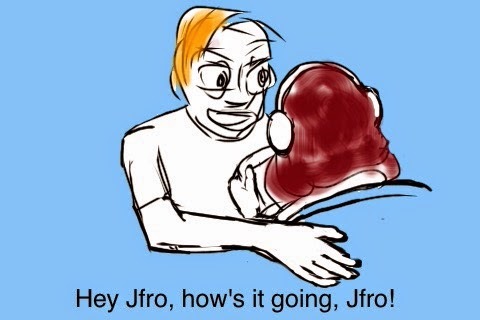 Please share this widely, Jfro fans, so I can get a piece of that sweet zeitgeist action.